Q - I need directions to the boat, do you have a map? Click here, you can print this map for the car. Q - I want to plan a trip with Jodie Lynn, but I am not sure when is the best time to go. You can catch fish any time of the year; however some fish are caught more frequently during certain months and peak seasons in teh St. Ausutine area. Please check out our moon chart and peak season chart to assist you in choosing. Q – What do I need to provide? 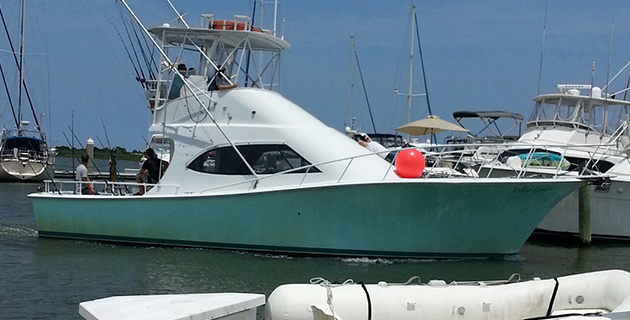 We provide everything you need to fish: bait, tackle, fishing license, First Mate, and fish cleaning. You will want to bring sun screen, a hat, food and drinks or see the catering menu, and of course a camera. Q – Can I bring my own reel and rod? Q – Do I need fishing experience? Q - What is commonly caught on board? 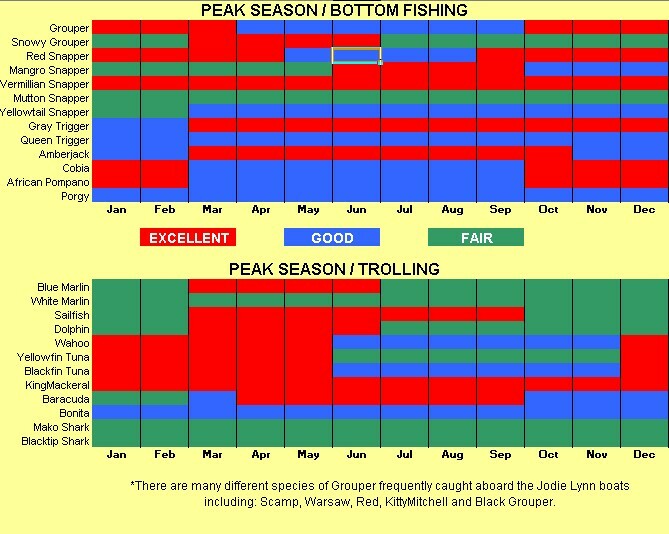 Fishing always varies from season to season. To see my latest fishing report visit my fishing report updated weekly. Q - Are the fish edible? Some of the fish you are likely to catch are edible, and is yours to keep. Generally, if the fish is not edible, we release it, or use it for bait. Q - What if I catch a really big fish? We have a great taxidermist and they do fantastic work. If you catch a big one, tell your mate you want to mount it, and they will be happy to help you set everything up with the taxidermist. Q - I want to go fishing, but I can't find enough people to go. Can you help? Yes. We do make up charters. Q – Are there any age requirements? Q – Do you provide bathroom facilities on the boats? Yes- all our boats have a “Head” (bathroom). Q – Do your boats have air-conditioning? Yes, we provide air conditioning. Q - Is there a website that shows the marine weather? wunderground.com shows the marine weather for our area, you can also look at real time data from our sea bouy weather station. The sea buoy is about 40 nautical miles east, northeast of St. Augustine. Q – Can I bring alcohol on the boat? Q – How many people can I bring? Up to 10 people allowed during a charter.